You never know where research might lead. 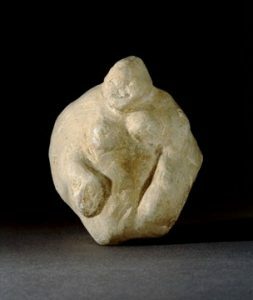 Back in 2010 one of the largest research projects yet undertaken by the Sainsbury Institute resulted in an exhibition of prehistoric ceramic figures from Japan and the Balkans at the Sainsbury Centre for Visual Arts. Entitled unearthed, the exhibition set the wonderful examples of ‘goggle-eyed’ figurines in the Sainsbury Collections at the University of East Anglia in a global comparative perspective. Many friends of the Institute came to see it, along with a number of groups from Japan, who were intrigued to see what Norwich made of the precious prehistoric dogu. Through the good offices of our major research partner in the overall project (which was called Dogu: spirits of clay and funded in large part through a special Museums and Galleries scheme offered by the Arts and Humanities Research Council), the British Museum, we were able to borrow Norfolk’s own purportedly ‘Neolithic’ figurine, the chalk ‘goddess’ discovered during excavations in 1939 at the renowned Neolithic flint mines at Grimes Graves, some 30 miles south of Norwich, in the heart of Thetford Forest and the landscape of the Brecks. I say ‘purportedly’ as subsequent research and accounts by those involved in the excavations strongly suggest that this evocative and enigmatic object was in fact made by the workmen involved in what was by most accounts a rather dull dig. This resulted in the ‘goddess’ being removed from public show in the British Museum, where it had been exhibited as the only example of a Neolithic figurine from the British Isles, and consigned to obscurity in the Museum’s capacious stores along with many other fakes and dubious acquisitions. One of the objectives of unearthed was to revitalise the debate around prehistoric figurines by setting them alongside contemporary artworks, and hence we felt the Grimes Graves ‘goddess’ would fit perfectly, its ambiguity contributing to the effect we were trying to achieve. So it was that the lumpy white ‘deity’ came face to face with audiences from the county in which it was discovered for the very first time, as well as with visitors from Japan. Most people were enchanted by the ‘goddess’, as they were with the replica of the only National Treasure from the whole of the island of Hokkaido, an exquisite hollow ceramic figure discovered at Chobonaino near Hakodate by an old lady digging potatoes, and the most regal of all the ‘prehistoric Macedonian ladies’ (an earlier exhibition of which had been one of the major inspirations for our project), the ‘Great Mother from Skopje, now resident in the Museum of Macedonia. One group that was particularly enamoured by the Goddess included archaeologists from the small town of Nagawa, high up on one of the volcanic massifs that dominate the centre of Nagano prefecture, in the heart of the largest Japanese island of Honshu. Nagawa is famous for obsidian, the remarkable glass-like volcanic stone that was the material of choice for prehistoric tool makers in Japan (and in many other parts of the world, notably the Mediterranean and the Americas). Nagawa is home to a splendid Obsidian Museum, and also Meiji University’s Obsidian Research Centre. The obsidian mines in the town are currently being excavated. While our Japanese colleagues were with us, we arranged for them to have a demonstration of flint working by the doyenne of the world of flint, John Lord, who himself worked for many years at Grimes Graves. 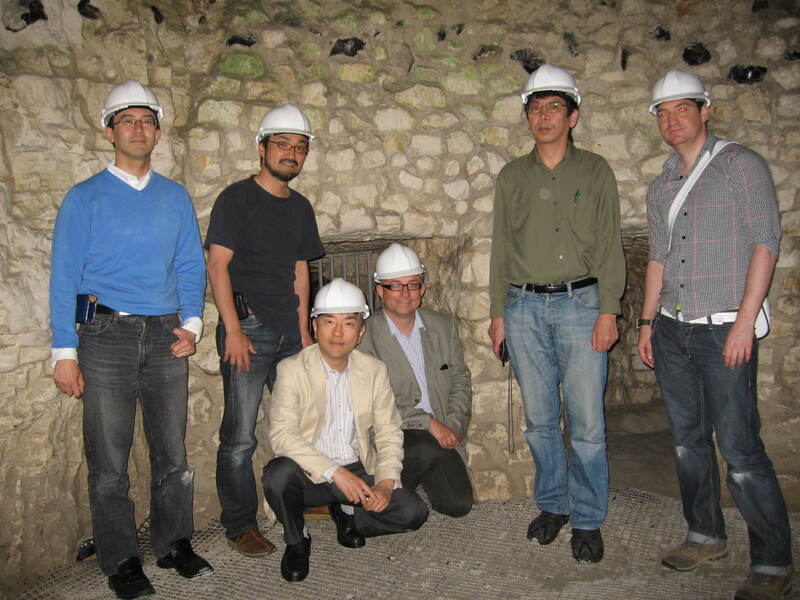 Several months later, we were approached by our Senior Advisor on archaeology, Professor Kobayashi Tatsuo, asking if there was any way that we could facilitate a relationship between Nagawa and East Anglia. This initial approach has so far resulted in two delegations from Nagawa coming to Norwich (including the irrepressibly enthusiastic Mayor Hata), the signing of agreements of cooperation between Nagawa and the Sainsbury Institute and the Ancient House Museum in Thetford (which we featured in a previous e-magazine article about our Online Resource on Japanese Archaeology and Cultural Heritage which you can see at www.orjach.org), and visits by the Curator of the Ancient House Museum, Oliver Bone, and the Deputy Head of the Thetford Grammar School (one of the oldest schools in the country), to Nagawa, for their Obsidian Festival in August 2013 (which coincided with a once-in-twenty years religious festival which involves hauling immense tree trunks around the town and before finally setting them up in front of the town’s main Shinto shrine). In June the majority of the Nagawa Town Council plans to visit Thetford, and we hope that the members of the redoubtable Teenage History Club from the Ancient House Museum might visit Nagawa at the end of August, with further exchanges to follow. We agreed from the outset that any relationship between Nagawa and Thetford should be built around archaeology and cultural heritage, in particular flint and obsidian. With this in mind, plans are afoot to incorporate some Norfolk flint into a new municipal building under construction in Nagawa due for completion this year. And some Nagawa obsidian will be included in a special exhibition about flint and stone working at the Ancient House Museum, which opens in November for a year. We are also planning an international conference on flint and obsidian in 2016 while the exhibition is on. In addition, we have been invited to become involved in a major new Heritage Lottery Fund sponsored project Breaking New Ground (http://www.breakingnewground.org.uk), reconnecting people with the Brecklands, much of which is designated as an Area of Outstanding Natural Beauty. This is of great interest to our Nagawa colleagues, facing rural depopulation and the challenges of sustaining small agricultural communities in contemporary Japan.